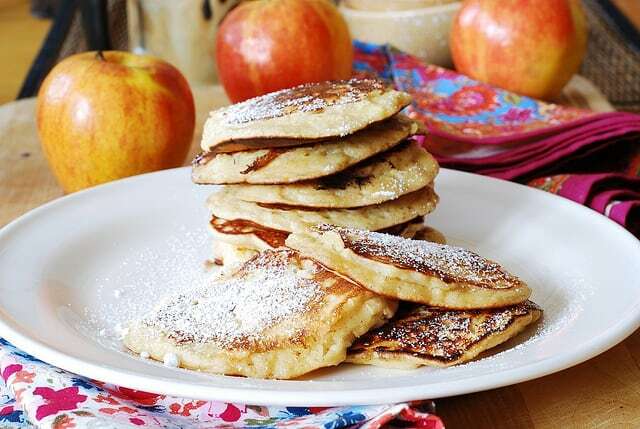 Apple Cinnamon Greek Yogurt pancakes – pancakes stuffed with shredded apples. Made with Greek Yogurt instead of milk. Delicious breakfast recipe! 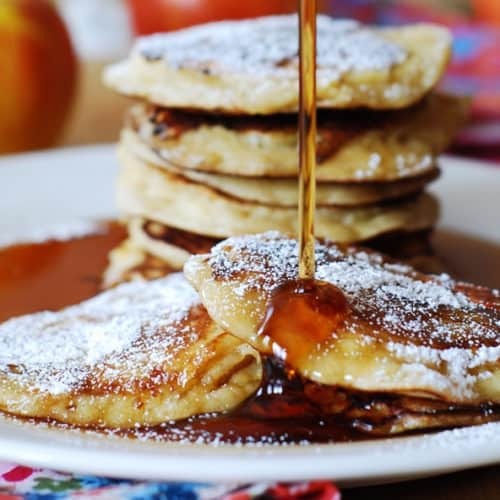 When I saw this recipe for apple cinnamon pancakes in one of the earlier posts on Smitten Kitchen, I immediately knew that I will be including them into my weekend breakfast recipe repertoire. Regular plain pancakes always seem, well, too plain. 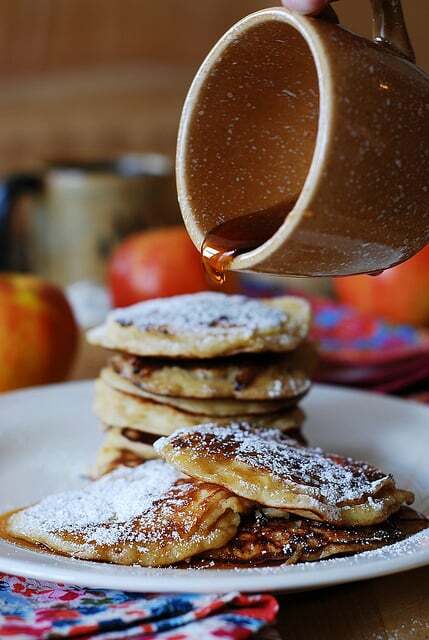 Pancakes filled with shredded apples? That’s my kind of pancake – not too plain! Not to forget about added spices: vanilla and cinnamon. And, for a touch of a wonderful sour taste, these pancakes are made using Greek yogurt instead of milk. I’ve made several changes to this breakfast pancake recipe. Deb used milk, and I’m using Greek yogurt because I love the slightly sour taste that pancakes acquire from Greek yogurt. Also, after reading comments on Smitten Kitchen, quite a few readers talked how the pancakes came out too thick, too dense, almost cake-like. I didn’t want this kind of density in my pancakes, and realizing that Greek yogurt is quite thick, I adjusted the recipe by adding 1/2 cup half-and-half (I used half-and-half instead of milk, so that I get the slight buttery taste in my pancakes, too). I added cinnamon and vanilla to the batter because the comments and Deb herself said that her pancakes tasted somewhat bland and needed some flavor addition. In comments, people were suggesting to add all sorts of interesting things to the batter: from bacon to calvados liquor. I did not venture that far: in my version of this recipe, my added flavorings were Greek yogurt (adding a nice sour touch), cinnamon, and vanilla. Grated apple inside the pancake perfectly complemented all three of them. I also halved the recipe, using only 1 cup of flour instead of 2 and using only 1 apple instead of 3. The recipe on Deb’s site makes a huge amount of pancakes. My recipe made 12 good size pancakes. If you need more, just double the recipe. 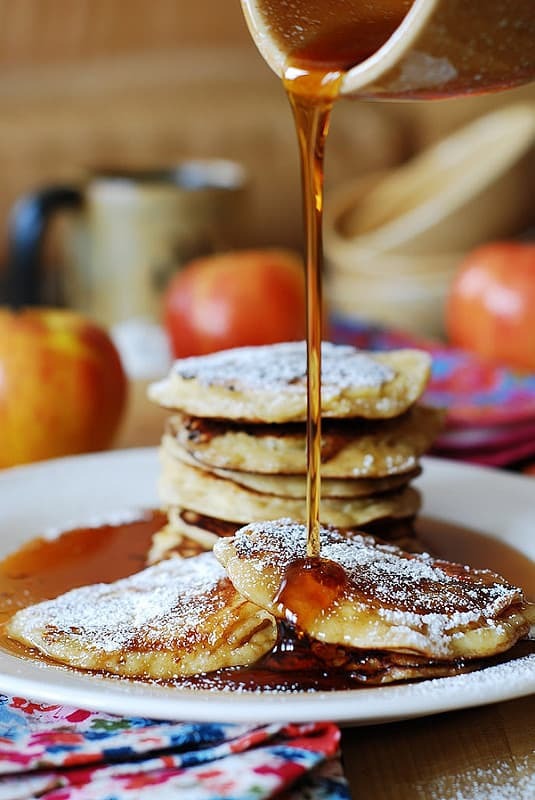 Also, my suggestion with these apple cinnamon yogurt pancakes is to eat them the same day you make them for breakfast as they are the best the first day. They might get a bit soggy the next day because of all the shredded apples inside. 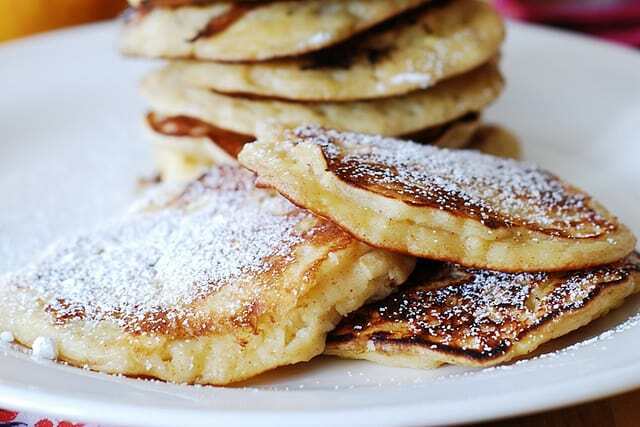 Pancakes filled with shredded apples? I am in! Are you? That's my kind of pancake - not too plain! 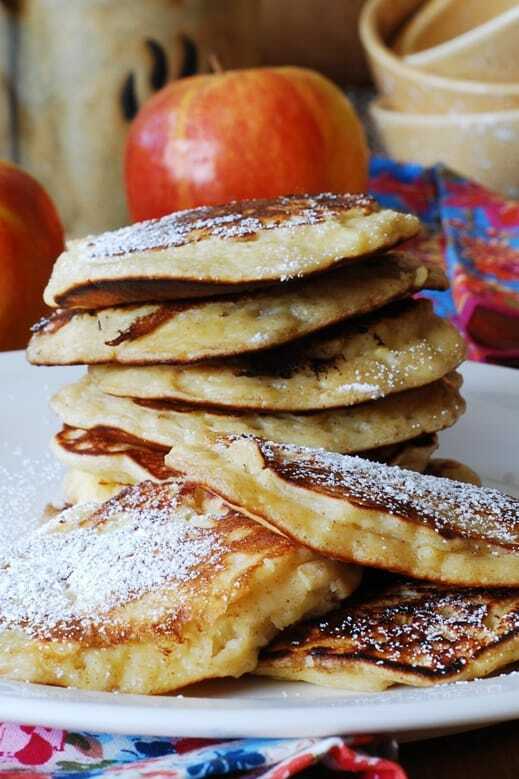 These Greek yogurt pancakes are stuffed with shredded apples, flavored with vanilla and cinnamon. They are made using Greek yogurt which brings a touch of a wonderful sour taste. Add egg, Greek yogurt and half-and-half together into a large bowl. Mix until you reach even consistency. To the same bowl add flour, baking powder, salt, sugar, cinnamon, vanilla. Whisk until well combined and creamy. Peel and core an apple. 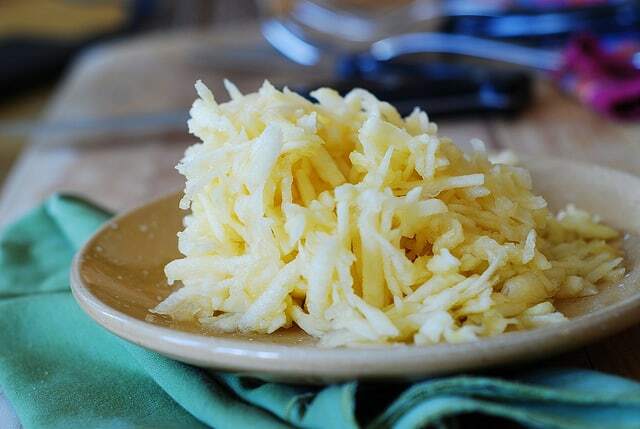 Using grater or food processor, grate peeled and cored apple into thin shreds. Add shredded apples to the batter and mix together. Heat a skillet suitable for pancakes over medium heat. Spray it with oil. 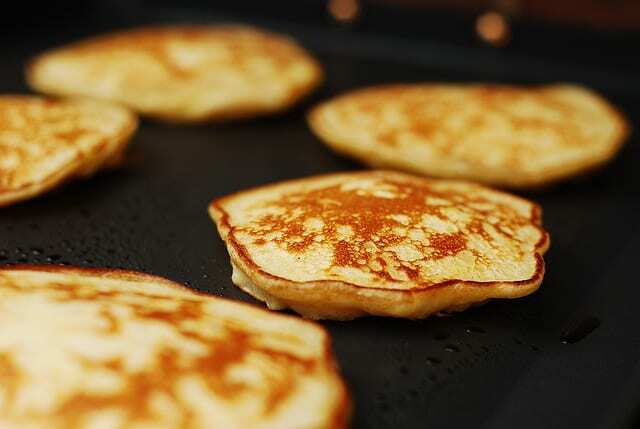 Using 1/4 cup measuring cup, drop 1/4 cupfuls of pancake batter into the pan and cook until pancakes turn golden brown underneath and the upper side puffs up and dries around edges. 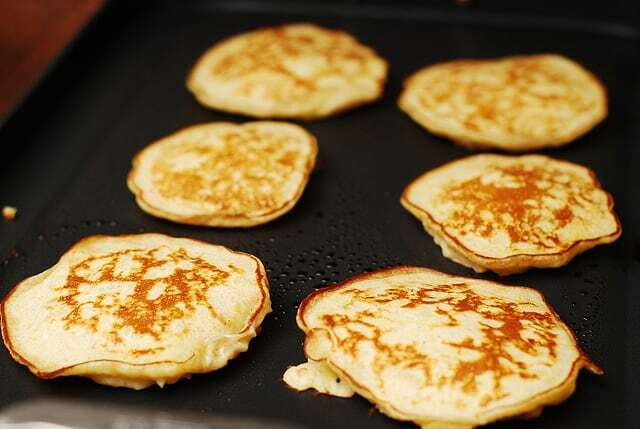 Flip the pancakes to the other side and cook them for an additional two or three minutes on the other side. 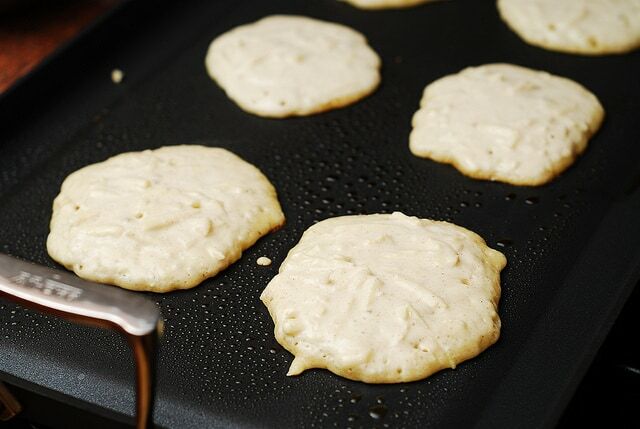 To serve, dust with powdered sugar and serve with real maple syrup. My toddler (and I) love these pancakes! I make and freeze them for future snacking and they work a charm. 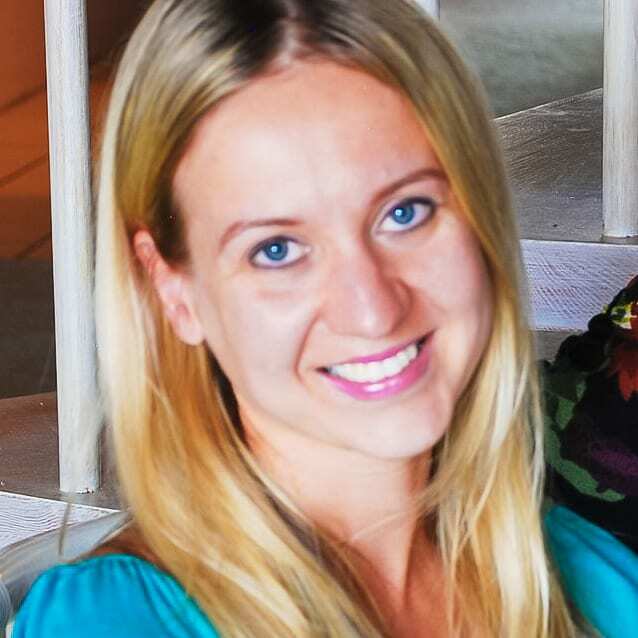 So happy to hear that! I am glad you’ve been enjoying these pancakes. Wonder if I could use applesauce in these? These pancakes didnt work for me at all!!!! These look so good! Love this idea for a fun fall breakfast! My toddler loved helping make and eat these, thanks! What a great idea for breakfast! These sound so good and kid friendly! !